The past is full of pitfalls-dining rooms that were draughty, dismal and decoratively dull, shoehorned into London basements or the coldest reaches of country houses. 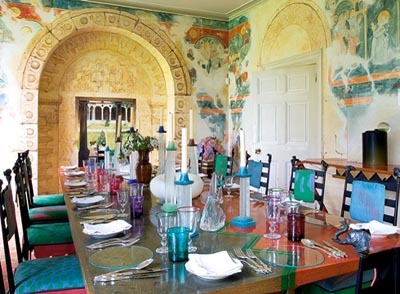 In the 21st century, the dining room is the least-used room in Britain. It can regain its spurs through sheer visual bravura, a full-throttle assault on the senses, no longer confined to a palette of red and green, a playing-cards gallery of spoon-faced portraits, smoking chimneys and electroplate palm trees complete with grazing camels marching across the brown-wood table. Let the perfect dining room contain within its four walls the essence of celebration, a distillation of happy memories, from family Christmases and confirmation lunches, to school projects for which only the dining table is big enough. Light, light, light. Light falls through tall windows onto Sunday lunches when the vegetables on the serving table are glazed with sunshine; it transforms a table without a cloth into a pool of molten mahogany. In the evening, candles and wall lights are forgiving to cutlery you will never have time to polish; their vellum-coloured glow irradiates the waterfall swags of a chandelier, the gilded frame of a painting you have chosen not because the dining room is the only room big enough, but because you love it above all others. That gentle light, mobile as moths’ wings, skitters off walls on which the painted colour has been built up in layers then glazed, so the effect is like lacquering, like the luscious skin of ripe aubergines or the bright contours of a chilli pepper. In the perfect dining room, darkness is harnessed and controlled, exploited to flatter rosy faces and old china, a full-bodied Burgundy with its garnet depths or the soft sheen of scuffed panelling. There are always practicalities. In an ideal dining room, these are taken care of effortlessly or invisibly-like the hidden washing-up machine and the jib door opening on to china cupboards or a pantry. Floors need to be indestructible or impervious to the debris of enthusiastic hospitality: spilt wine, gravy, an upturned soup plate. When you open the door on a quiet afternoon when the dining room is resting, nothing is forlorn or stale-rather, the last residue of dinners past lingers like petals trapped in amber, to make the nostrils twitch, memories leap, bringing a smile to the lips. Flowers and flowering plants enliven this often uninhabited space, grown in cachepots and baskets on marble-topped tables or in spindly legged jardinières in the window’s embrace. Siting your drinks table in the dining room ensures a steady flow of visitors: a well-stocked drinks table needs good lighting, a Generation Game conveyor belt of glass options, and waste-paper baskets for mixer cans and bottles. No really handsome dining room is complete without an element of fantasy, even if that fantasy is an illusion of holding the world at bay through the elegant traditions of old-fashioned dining. It may equally take the form of sumptuous scenic wallpaper, dark-foxed pier glasses, a silver chandelier-or a beautiful chatelaine, sporting the family rubies beneath a paper party hat.